The identity of the bird here is uncertain. Robert Hall saw it as a quail but it might equally be a chick or any number of other young birds. The inscription is a common phrase derived from a poem by the Tang poet Meng Jiao, speaking of his joy at finally passing the recruitment examinations. The hope it expresses could be for general success, not only on the examinations. 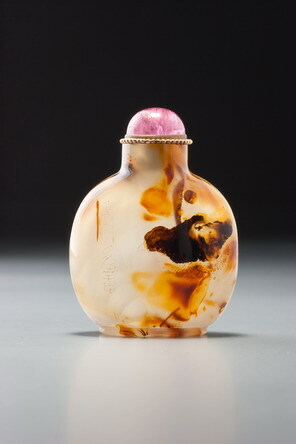 Such sentiments received on a valuable snuff bottle given by one’s emperor would be likely to encourage loyalty and commitment to official service, ultimately the main reason for such gifts, of course. Such bottles might also have been made for lower ranks of the Imperial family or members of the official class to give to others either for the same reason or to attain some other benefit in return, such as an audience with a higher official, a word in the right ear, or whatever was desired in the complex and often none-too-genteel corruption at court. The fact that it is written in seal script suggests that both donor and recipient were from the educated elite of rulers and scholars, for otherwise they would not be able to read this esoteric script. Although extremely well formed and hollowed, this example has the lazier, recessed convex foot discussed under Sale 3, lot 11. The centre of the inner foot is, in fact, at exactly the same level as the footrim in this case. This may suggest the beginning of the decline we have proposed for this and other technically less painstaking solutions to detailing, but otherwise, shape, style, hollowing, and quality would all allow, even if they do not dictate, a date in the second half of the Qianlong era. As with all declines, it has to start somewhere, and this may represent an earlier example where the first hints of laziness creep in, the thin-end of the wedge, so to speak.